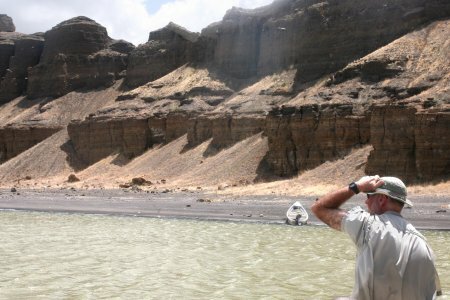 Craig Feibel brought Field School students on Sunday to Central Island, one of three volcanic islands in Lake Turkana. 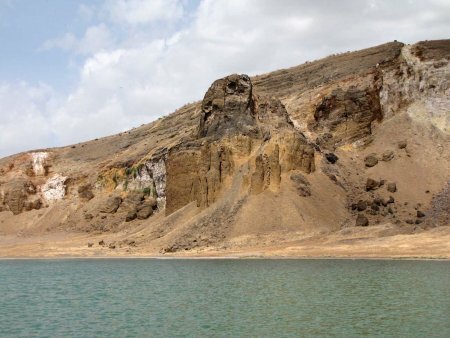 Formed within the last 10,000 years and active as recently as the 1970’s, Central Island is the perfect place to study the tectonic and volcanic processes that continue to shape East Africa’s Rift Valley. 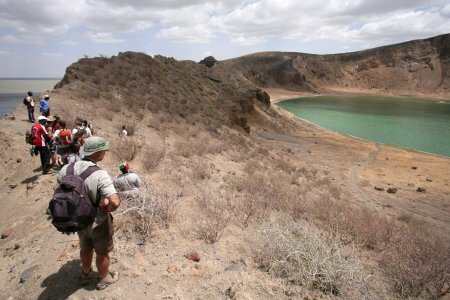 Students hike to the crater lake in Central Island, a volcano in the middle of Lake Turkana. Freshwater comes out of the ground at Eliye Springs. 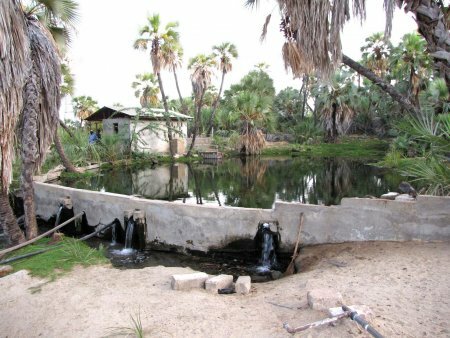 Eliye Springs is a beautiful little village on the west shore of Lake Turkana, just north of the Turkwell River. Its fresh water springs and lush vegetation are an attraction for tourists, but we came to use the village as a launching point for our trip up to Central Island. We left early in the morning and forded the Turkwell by foot, heading north, to reconnoitre with our lorry that had reached the other side the previous evening. This gave us a head start and allowed us to launch our boats from Eliye Springs early, before the sun rose too high. 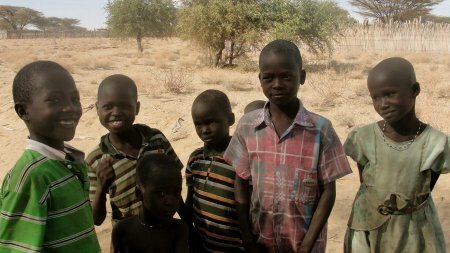 Children gather to see strangers in their village. These kids had a lot of fun playing with our cameras and investigating a whole truckload of newcomers stopping outside the Springs. Many of the people here spoke Turkana, the local language, Swahili, English, and even some French. 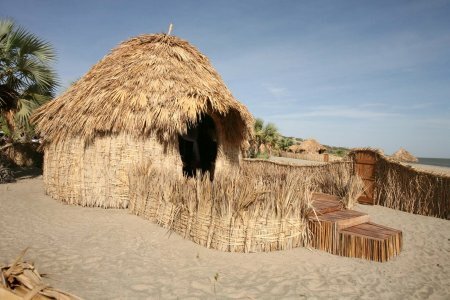 A fancier, tourist version of a Turkana Hut at Eliye Spings. 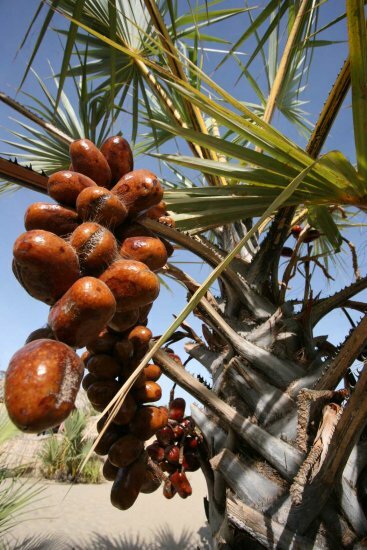 Mkoma hang beneath palm fronds on the beach. Dune seeds, called Mkoma by the people here, are eaten in times of starvation or stress. They can be cracked open with rocks, and taste a little like dried pastries, almost sweet. 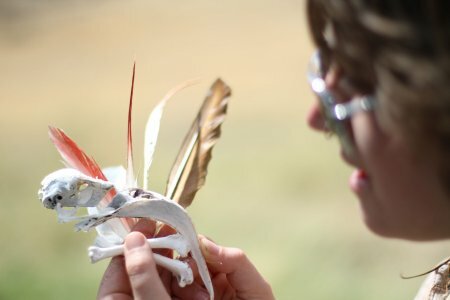 Some of the TBI students have been trying them near the Turkwell River. Luke’s hands sparkle with dried black sands. 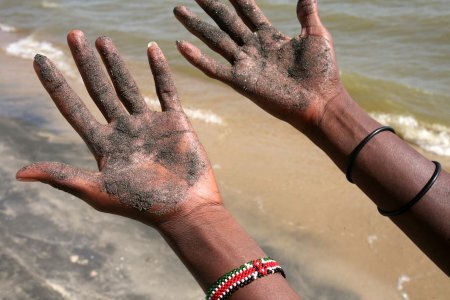 Luke, a Kenyan entomology student now training at TBI, rubbed black, amphibole sands from the lake onto his hands and watched them sparkle in the sun. 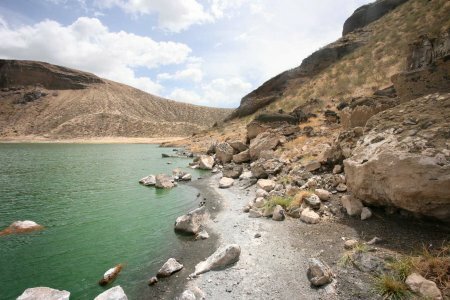 The dark minerals have likely drained from the Turkwell River, though black basalts may also have reached the beach from one of the Rift Valley’s many volcanoes. 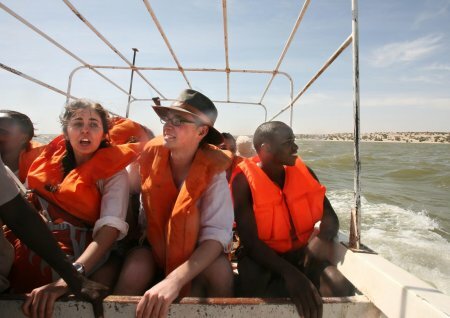 Chelsea, Ben and John hold on as the wind picks up over Lake Turkana. 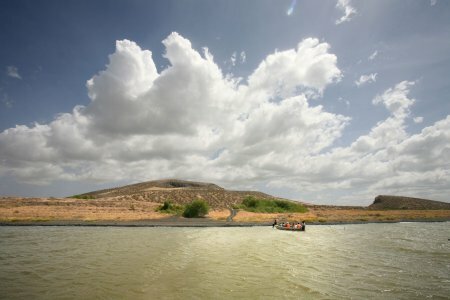 The ride to Central Island – in two, small fishing boats – took over an hour. Heading towards the island, great clouds of dust could be seen blowing out from the southeast, obscuring the far shore and sending great swells across the water. Though the waves were sometimes intimidating, the captains were never worried. These boats actually mimic Portuguese fishing vessels designed to withstand rough seas. Quan, Meadow, Kelly, Sonia and Alec watch Quan’s hat floating in the water. Almost to the island, Quan’s hat flew from his head, sending our boat back to fetch it from the water. The smaller of our boats lands on the south shore of Central Island. As often happens in the field, nothing turns out exactly as planned. After our first boat landed, we found the beach to be too shallow for the second. After a 2 minutes of shouting in 3 different languages, our second boat departed for another beach. Both landing parties hiked across the island to reassemble. Professor Craig Feibel sits at the bow of our boat, preparing for landing. The first boat joins us as the other group comes via land. 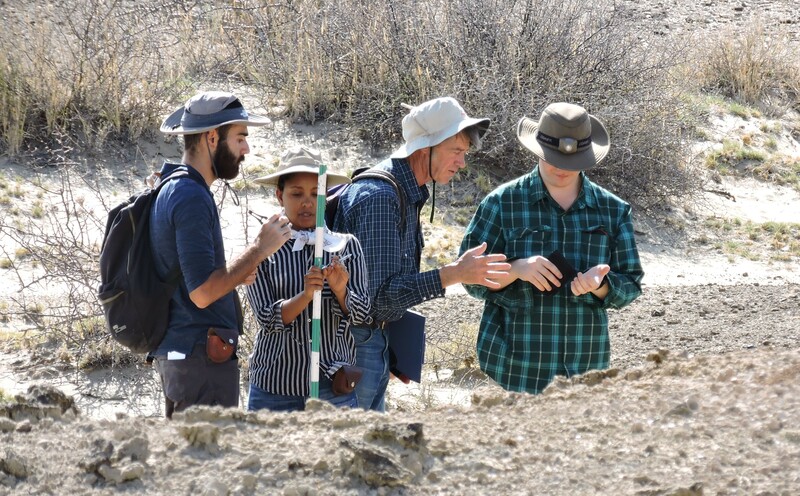 Professor Craig Feibel and students look down on Crater Lake. Lake Turkana behind us, we climbed to the rim of Central Island volcano to see the crater lake in its middle. 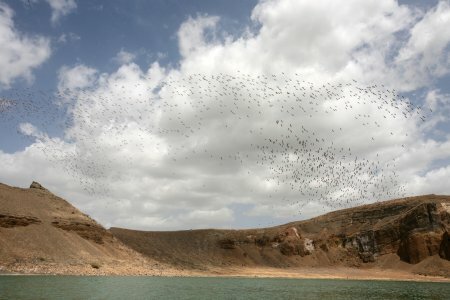 There are actually 2 separate lakes within the island, one famous for its crocodiles, the other for its flamingos. We visited the lake with flamingos. Sonia sits and looks at crater lake. Alec and Kelly arrive at crater lake. 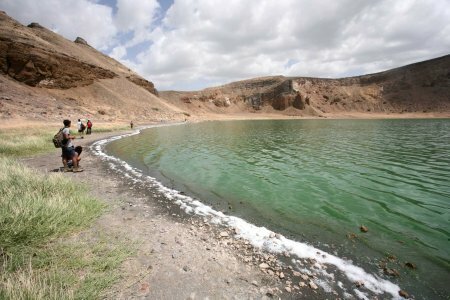 The inner lake is bright green, shockingly colorful when compared to the dust hue of Lake Turkana. 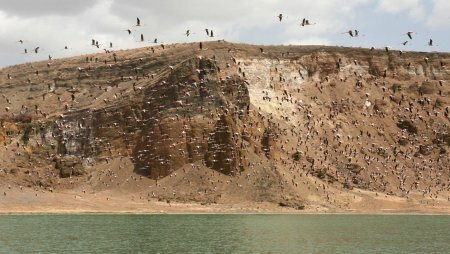 The lake is home to billions of microscopic algae called Spirulena platensis, a blue-green algae that is highly proteinaceous and a favorite food for flamingos. Craig cautions Meadow and others to beware of the grasses’ sharp spines. In addition to its poisonous snakes, scorpions, crocodiles and recent volcanic history, Central Island also has fields of sharp grasses called Sporobolus spicatus. These plants are quick to colonize new territory and thrive in the unusually salty waters of Central Island’s crater lake. A basalt plug rises up above the lake. These volcanic rocks are home to a great number of lizards and nesting shorebirds. 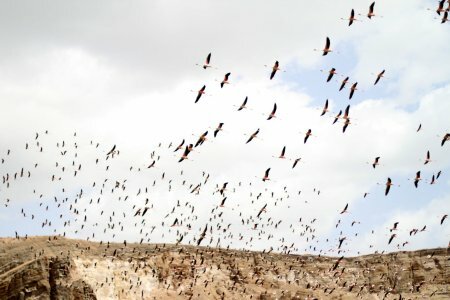 Flamingos take flight and circle the lake. As the circle the flamingo calls begin to echo around the entire crater. Wary of human intruders, the flamingos prefer isolated areas where they can feed in peace. Meadow finds the remains of a flamingo. 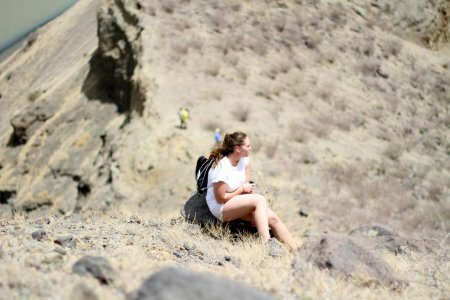 Chelsea and other students relax after their hike to crater lake. 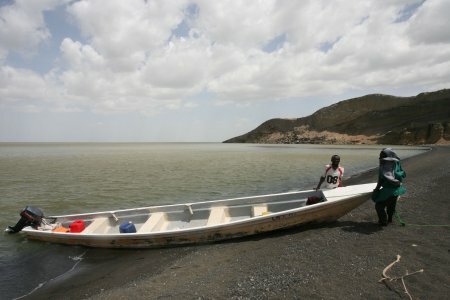 We were able to cool off from the midday hike by swimming briefly in Lake Turkana. 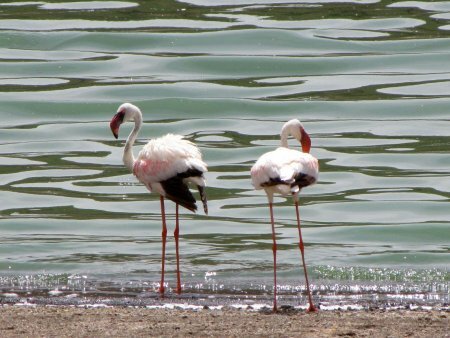 The shore was full of ibis, cranes, and a variety of fish including the famous Nile Perch. Johnpius and Julianne have fun in the water before the long ride home. Photos by Quan Duong, Craig Feibel, Meadow Coldon and Daniel Green.